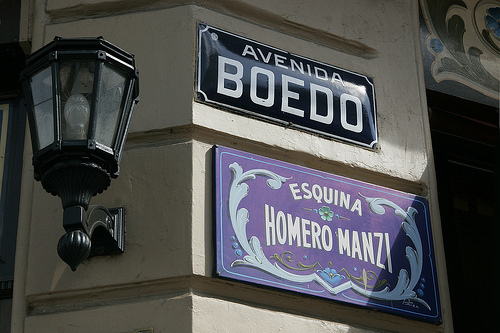 The corner of San Juan and Boedo, made famous by the tango singer Homero Manzi in the opening lines of his song Sur (‘San Juan y Boedo antiguo, y todo el cielo‘ – ‘Old San Juan and Boedo, and all the sky’) is the site of a café (now a tango show by night) that was a gathering place for local left-leaning writers and intellectuals in the 1920s. Close to the corner are a number of cafes and restaurants well worth the 20 minute trip from downtown or 30 minutes from Palermo, including Pan y Arte, Cossab and Cafe Margot. You might hear Boedo touted as Buenos Aires’ most up-and-coming neighbourhood, with its burgeoning arts scene, old school milongas (Tango dance halls) and claims to be the bona fide birthplace of the Tango. Although the idea that this traditional barrio is on the road to Palermo Soho style development might strike fear into the hearts of those who love it, for now at least it has retained an authentic, residential feel. Café Margot was first opened in 1904 and recently completed renovation work has restored the café’s exterior to its former glory. Inside, Café Margot is enchanting, with whole hams hanging from the ceiling, exhibitions by local artists on the walls and waiters in waistcoats swerving around closely packed wooden tables, balancing trays of coffees and medialunas (croissants) or bottles of beer and baskets of monkey nuts. But forget the inside. On a warm summer’s evening in the city there are few better places to be than sitting at a pavement table outside Margot drinking a cold beer and eating picadas (a shared plate of food to pick on such as olives, salami, ham and olives). 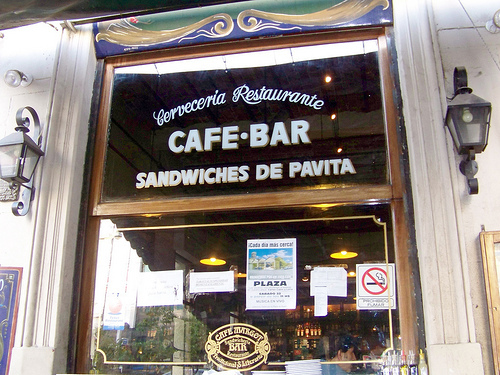 Also recommended are the sandwiches de pavita (turkey, the house special) and, when they have them, the empanadas de parrilla (empanadas filled with slices of steak). For more reviews of Cafe Margot, check out this blog post by Foodie in BsAs and Dan at Saltshaker’s turkey-tastic review.